Were I unable to digest wheat flour, I’d miss chocolate chip cookies as much as chewy bread and good pasta. That’s why I came up with this recipe for Almond and Buckwheat Flour Gluten Free Chocolate Chip Cookies. Inspired by Alice Medrich’s Flavor Flours, I had already been experimenting with buckwheat and oat flour as well as ground nuts to make cookies and piecrust. As the title of her book suggests, Medrich’s looking for the flavor in grains and nuts. That her recipes are suitable for people following a gluten free diet is secondary. New research done by Columbia University demonstrates that people without celiac disease, a diagnosed allergy to gluten, may be sensitive to wheat. So much for skeptics. Such research has made me reconsider adapting favorite recipes without wheat flour. Buckwheat’s naturally tan color mimics brown sugar while its flavor adds complexity to the taste of the cookies. An egg and some baking soda in the batter lightens the crumb. These cookies have a microscopic pebbly texture. Honey rather that granulated sugar helps the cookies spread during baking. I’d eat these on any diet. 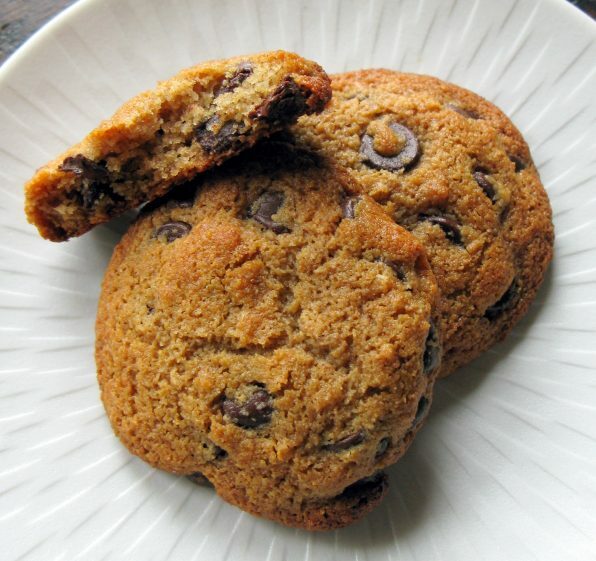 I developed this recipe for American Almond Products Company along with several chocolate chip cookie recipes that use some of their ingredients. This Crisp Amaretti Chocolate Chip Cookie recipe is another I crave with a cup of thick espresso. Their almond flour has the kind of fine texture that makes it ideal for making French macarons and light cakes. 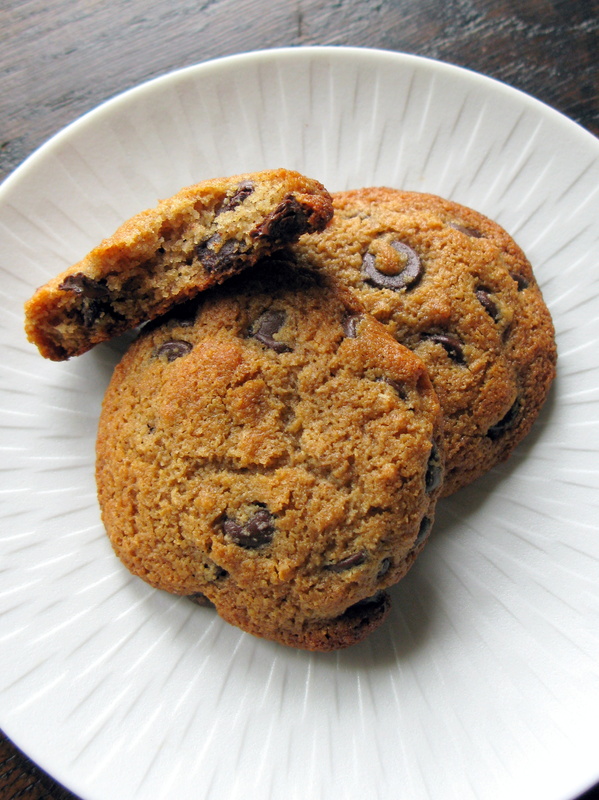 Here is a recipe for a toasty chocolate chip cookie made with finely milled almond flour and buckwheat flour. As the cookies bake, the almond flour in the batter browns, adding nutty notes to their flavor. Doubling up the baking sheets ensures an even bake. Skip this step if you have confidence in your oven's ability to bake evenly. And for a crisper texture, bake these cookies a little longer until they are a deep golden color. Whisk together the American Almond Blanched Almond Flour, the buckwheat flour, salt and baking soda. In a separate bowl, lightly whisk together the egg, melted butter, vanilla extract and honey. Add the butter mixture to the almond flour mixture. Stir in the chocolate chips. Let the cookie dough sit for 10 minutes. Using a small ½-ounce cookie scoop, place portions of the dough spaced 2 inches apart on the prepared baking sheets. Double pan each baking sheet and bake the dough until puffed and evenly browned, for approximately 12 to 14 minutes. Transfer the cookies to a rack to cool completely before serving. *Buckwheat is naturally gluten free. It can however become contaminated with other grains. To ensure that your cookies are suitable for a gluten-free diet, make sure to purchase buckwheat flour labeled " gluten free."